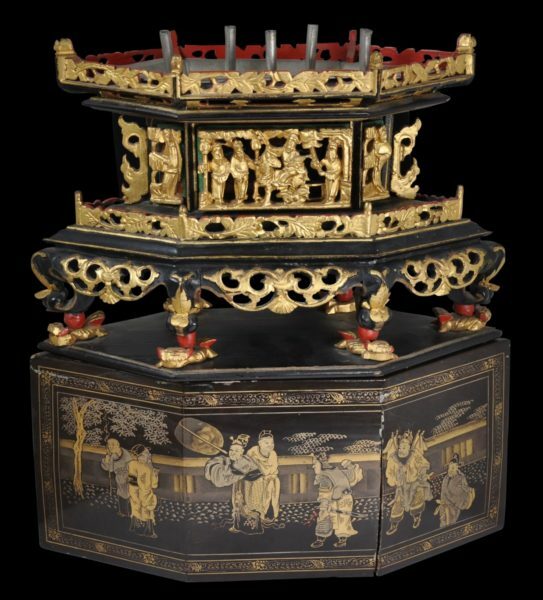 This six-sided chanab (called a beet-chien in Penang and a chien-arb or chanab) in Malacca and Singapore, executed in black and red lacquered and gilded pinewood and with a black and gold lacquered cover, is intricately carved with typically Chinese scenes. 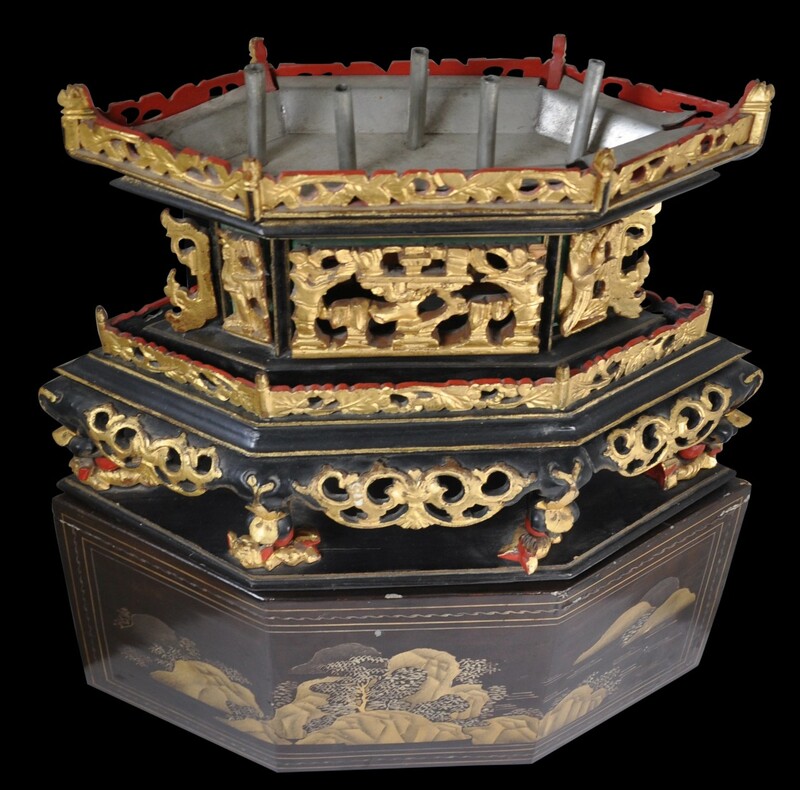 Importantly and unusually, it retains its original pewter tray in the top – usually these are lost. The rack held upright bamboo skewers of crystallised papaya atop the chanab as altar offerings. The chanab has six feet, each of which sits on movable, splendidly carved Buddhistic lions. When not in use, the lacquered cover would have been placed over the chanab to protect it. The cover is lacquered finely in black and gold on all sides with an idealised tranquil mountain scene. On the other is a scene from Chinese legend. A similar chanab is in Khoo (1996, p. 82) and in use, on p. 84. Others are illustrated in Ho (1994, p. 91); Tan (1993, p. 9); and Lee & Chen (1998, p. 46). Chanabs used by Straits and Peranakan Chinese of Southeast Asia tended to be of the hexagonal variety (such as the one here). Chanabs used by the Hokkien in China usually were square. 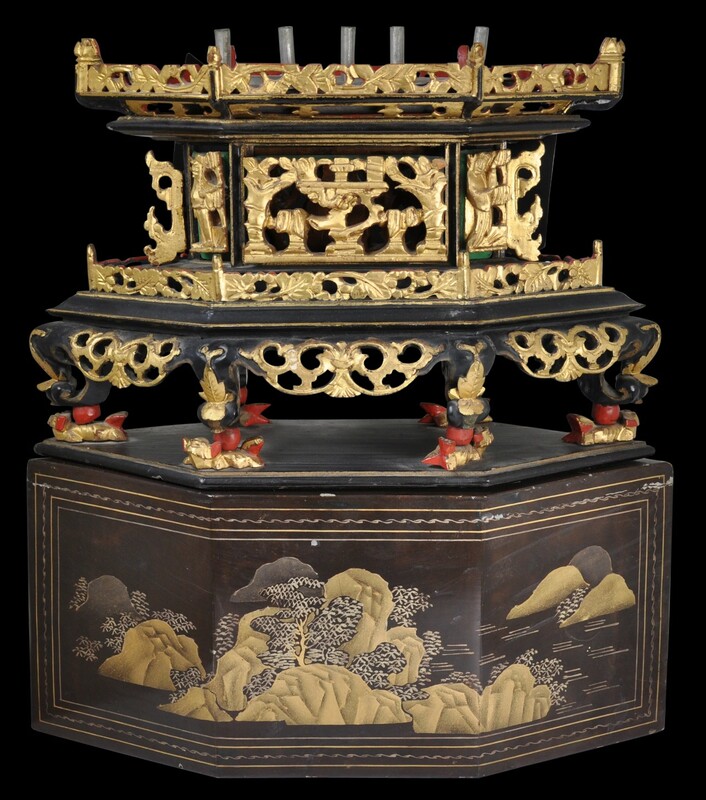 The chanab was placed in the centre of each Straits Chinese family’s sam kai altar, the most important altar in the family home. The sam kai altar was used for important ceremonies, particularly weddings. When not in use, the six-sided black lacquered box was placed over the chanab to protect it. The condition of the chanab here is very good. There are no losses to the carving. The box or cover no longer fits over the stand however. Probably it has shrunk with age – there is some cracking to the lacquer along its joins. Khoo J.E., The Straits Chinese: A Cultural History, Pepin Press, 1996. Ho, W.M., Straits Chinese Furniture, Times, 1994. Tan, C.B., Chinese Peranakan Heritage in Malaysia and Singapore, Penerbit Fajar Bakti, 1993. Lee, P. and J. Chen, Rumah Baba: Life in a Peranakan House, National Heritage Board, Singapore, 1998.